Noli Ergas never really "got into" tea; it just sort of grew on him. While living in Japan, he became accustomed to both the standard daily teas (sencha, genmaicha, mugicha, etc.) and the traditional tea of Japanese tea ceremony (matcha). Daily habit grew into interest which grew into passion. Now, he is one of the few outside of Japan certified as a Japanese Tea Advisor by the Japanese Tea Instructor Association. With an education in the sciences (BA in Geology and MS in Biology), Noli has a solid scientific background to aid in understanding and communicating the processes by which tea is grown and how it benefits our health. 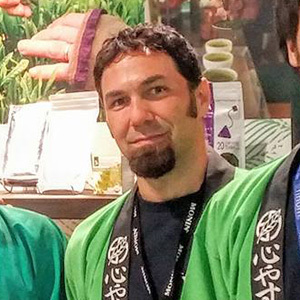 With his background in education (Teaching Certification in Japanese), Noli enjoys spreading knowledge on any topic from organic tea farming to Japanese Tea 101 to nutrients in tea.